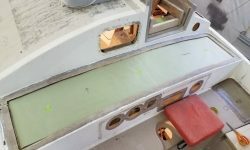 In the cockpit, I got started with the remaining top skin deck patches. 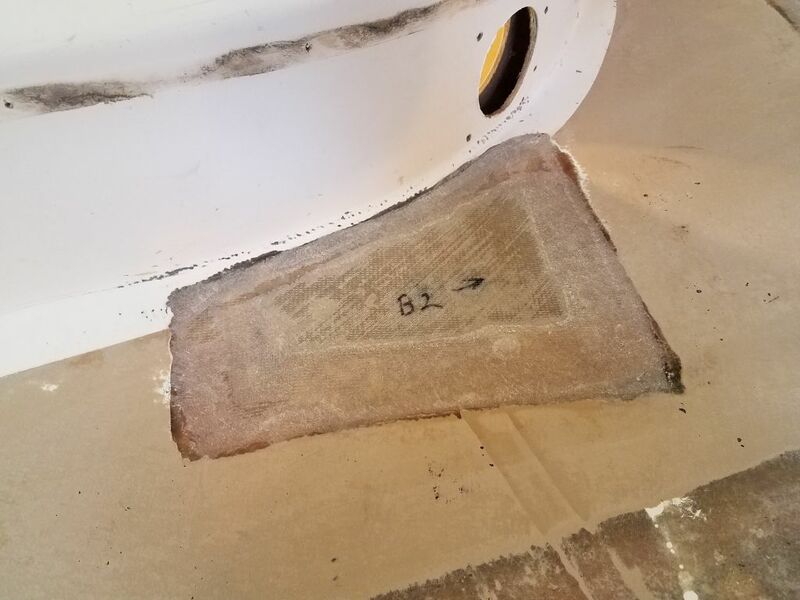 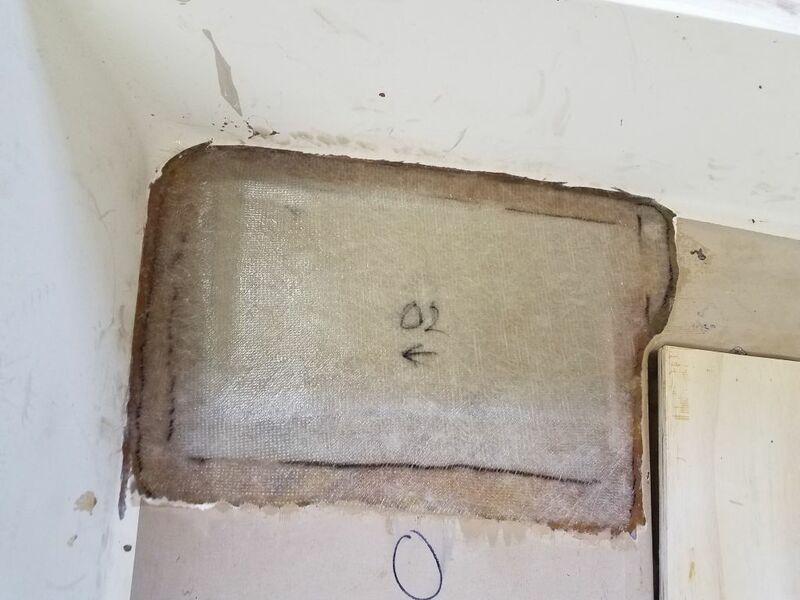 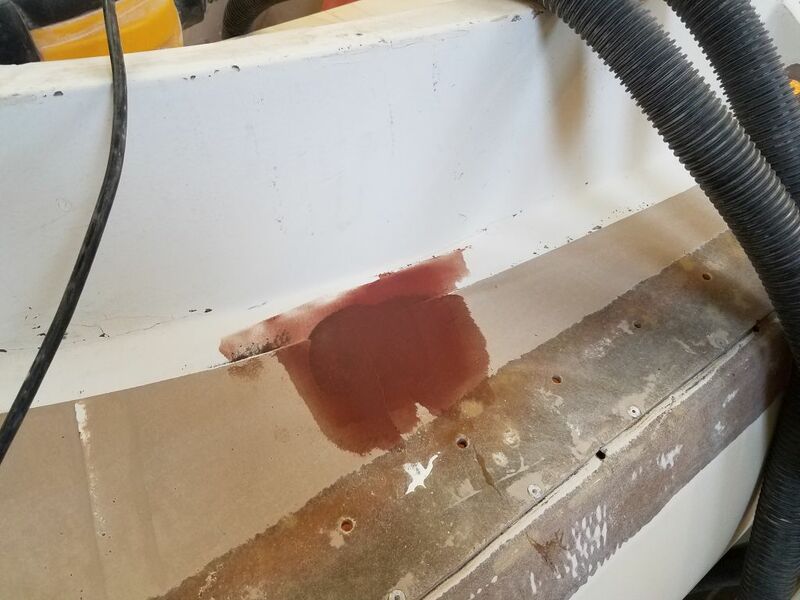 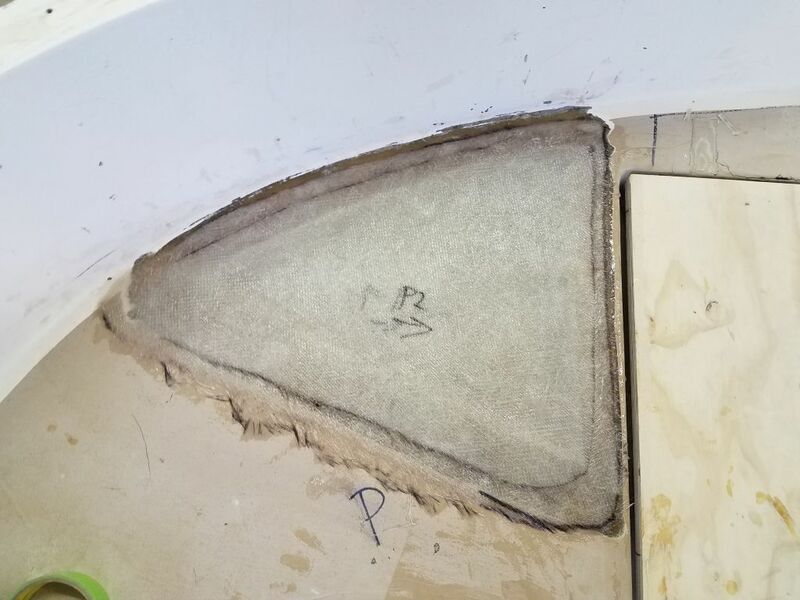 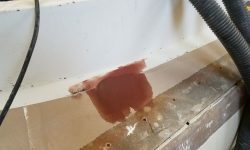 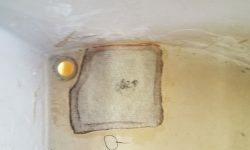 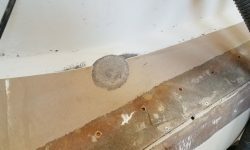 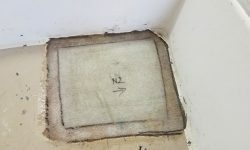 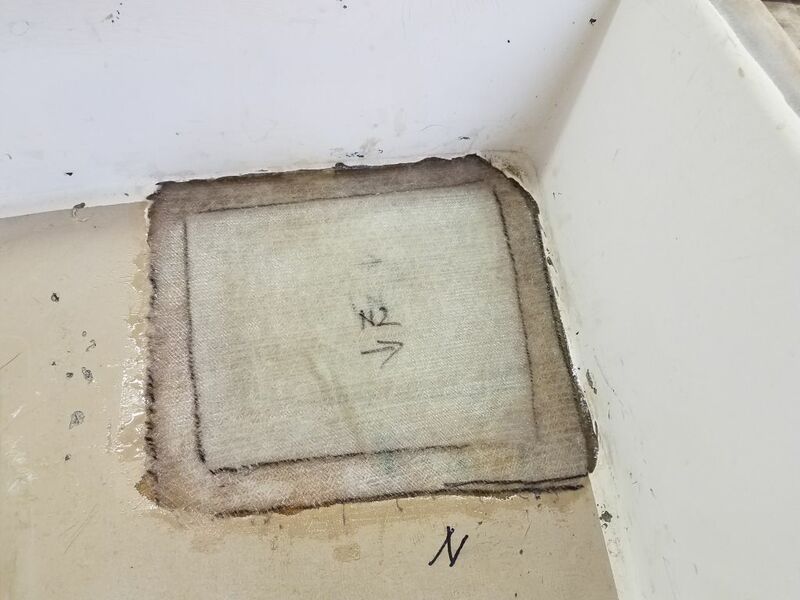 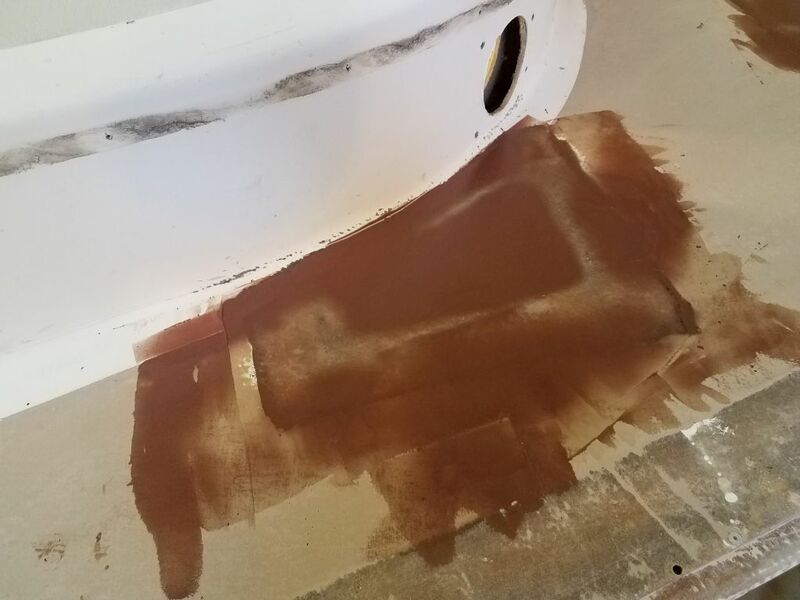 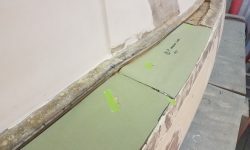 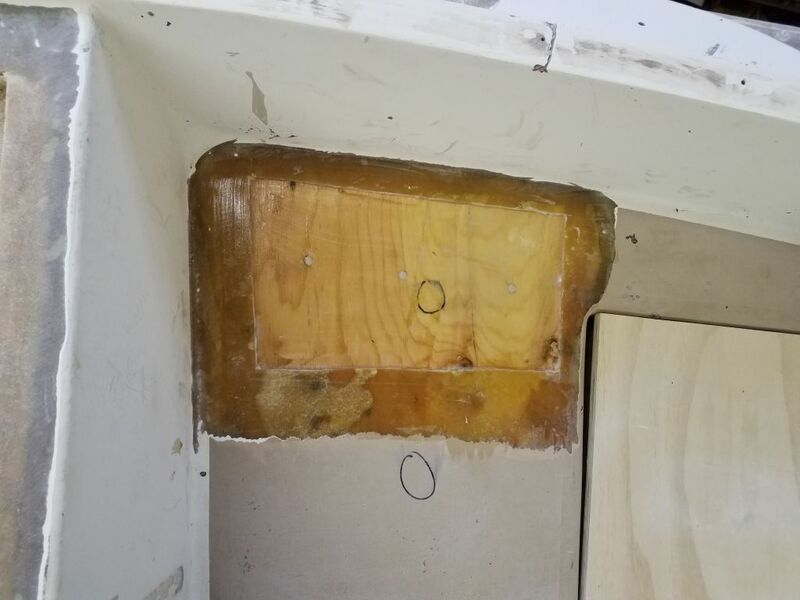 After final cleanup, I used thickened epoxy to fill small voids and holes in the exposed plywood core, and wet out the core and surrounding areas. 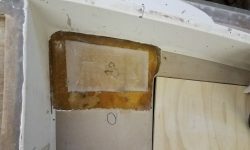 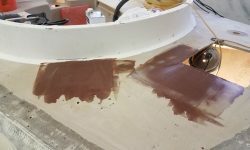 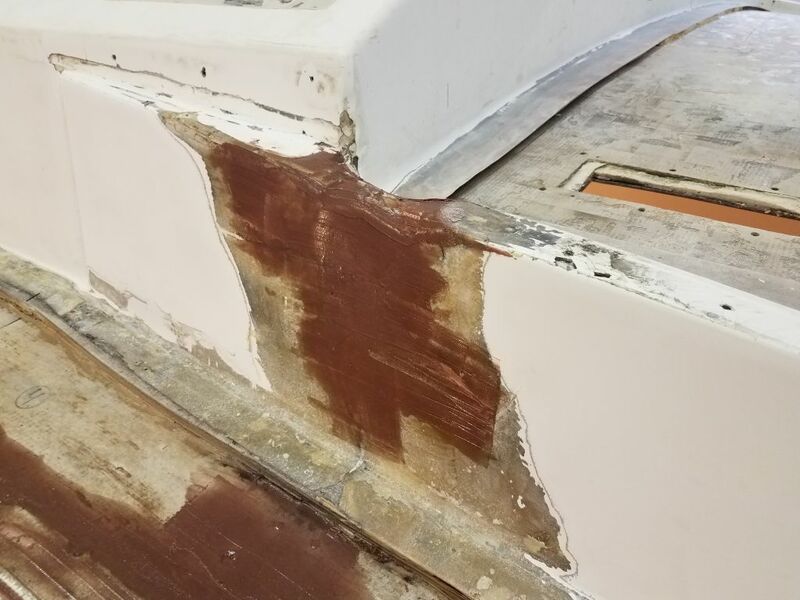 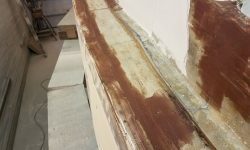 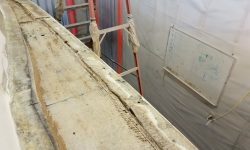 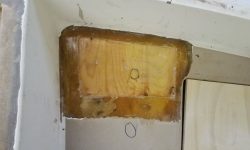 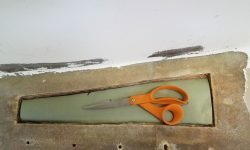 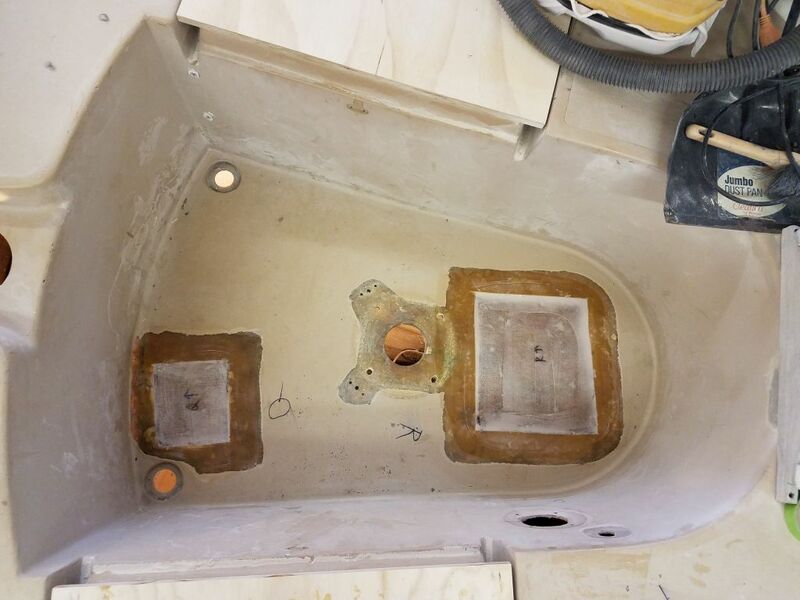 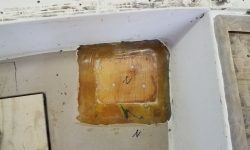 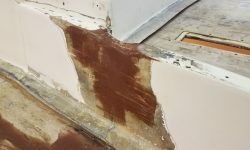 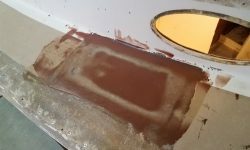 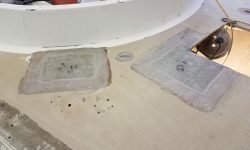 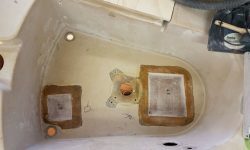 Then, I installed three layers of fiberglass in epoxy resin to complete the repairs. 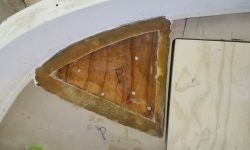 I left the area around the steering pedestal hole for later, as I still had to prepare and fill the large hole in the sole first. 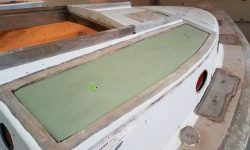 Next, I made paper patterns of the deck sections to be recored: two areas on the coachroof and the bridgedeck, plus a small section of the starboard sidedeck outboard of the cockpit. 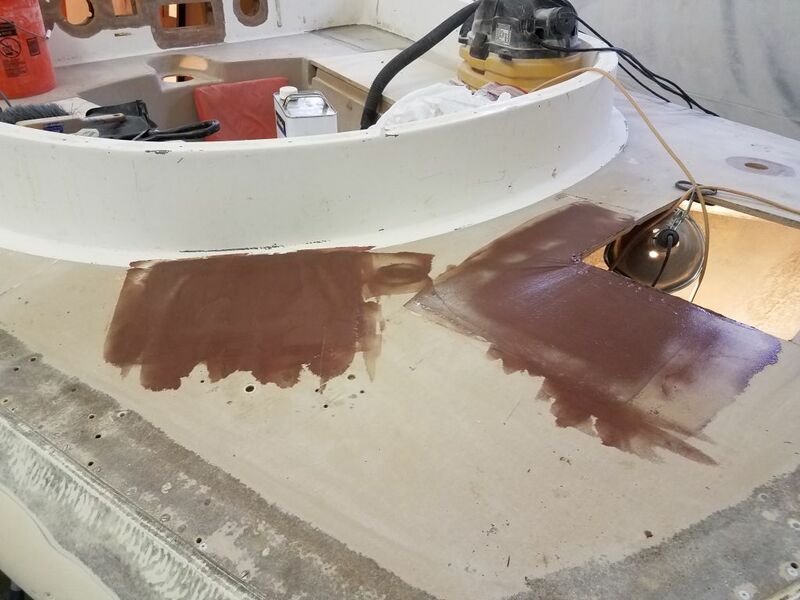 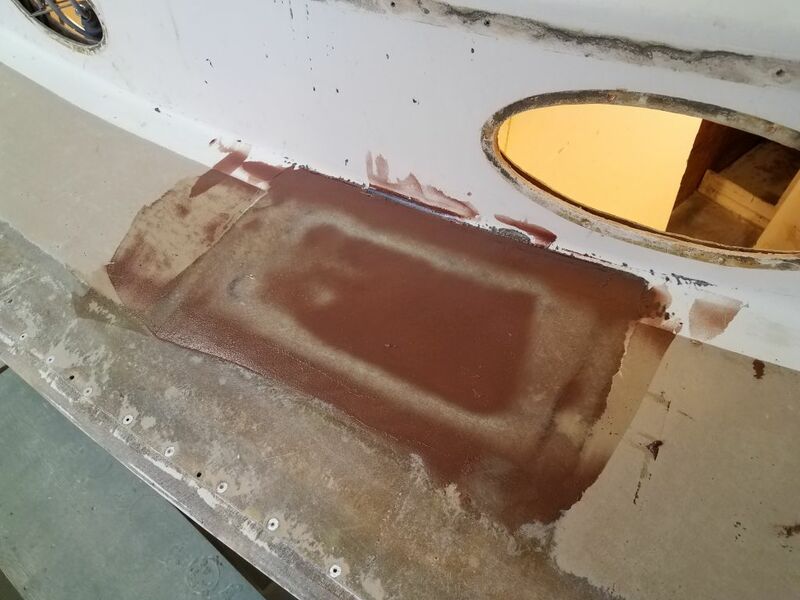 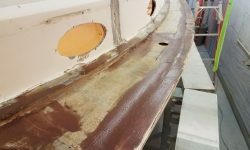 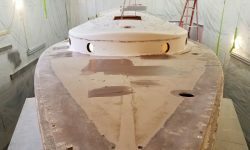 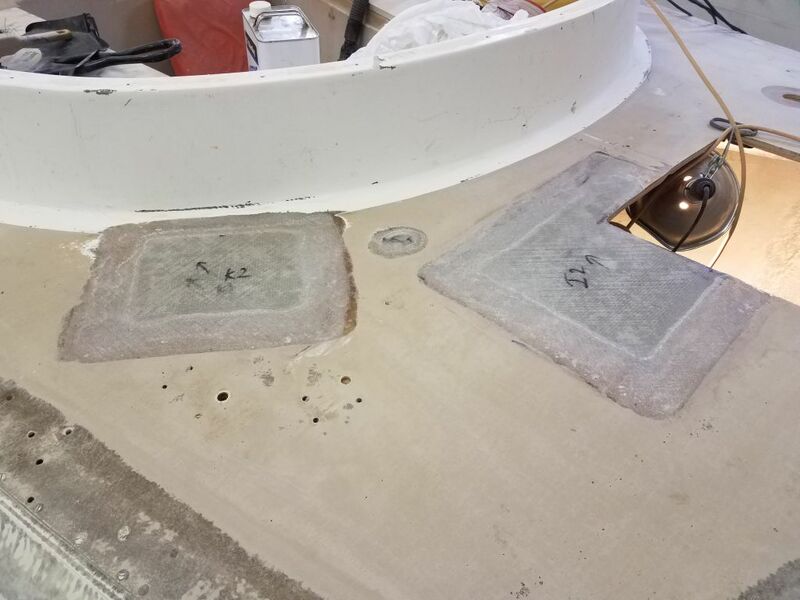 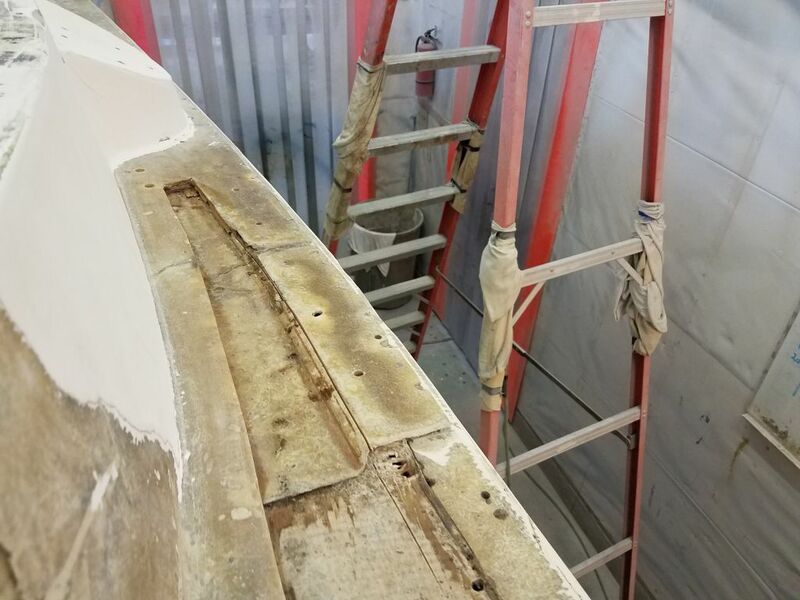 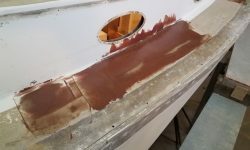 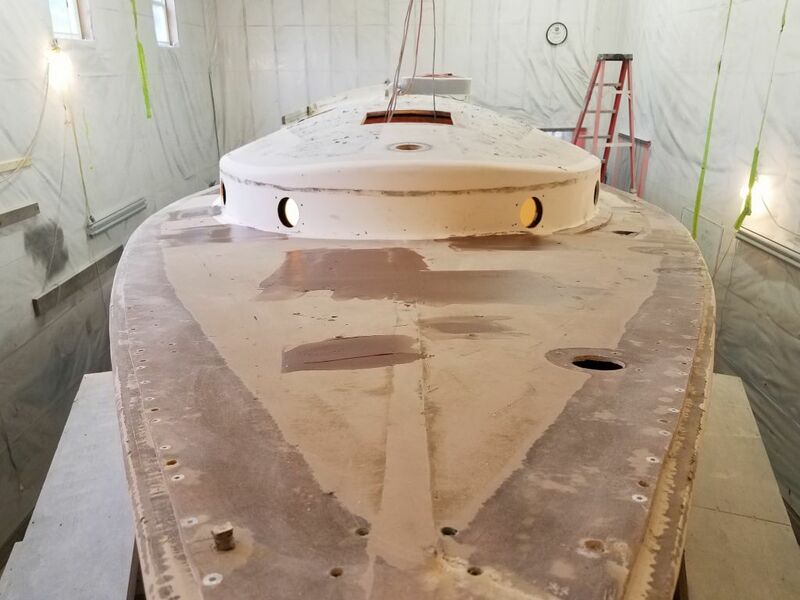 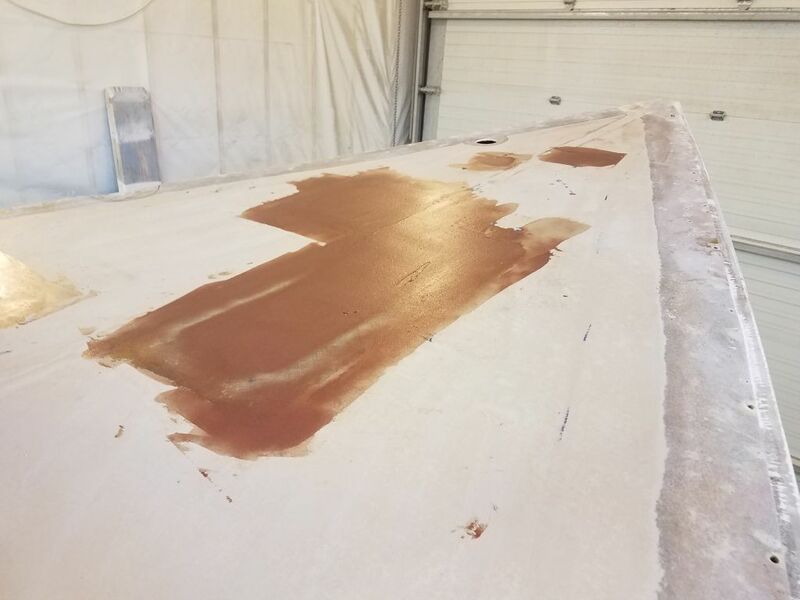 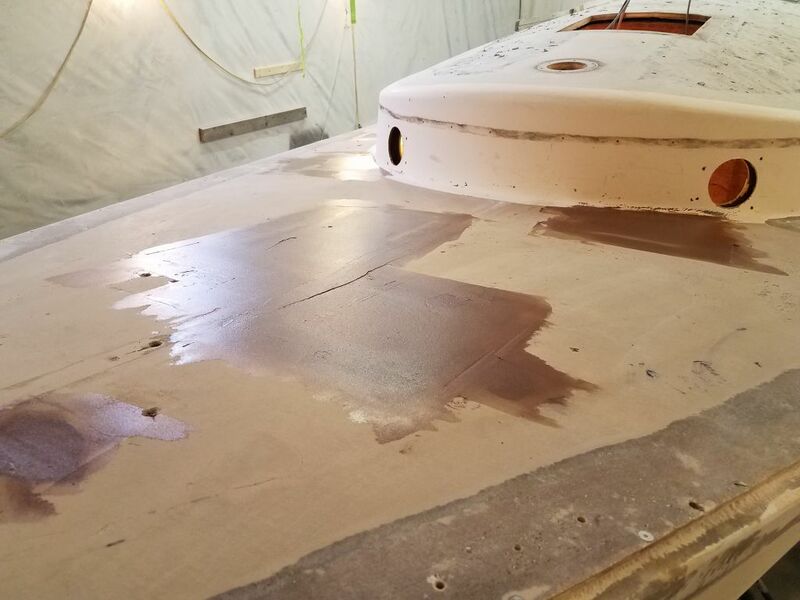 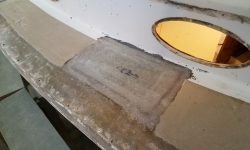 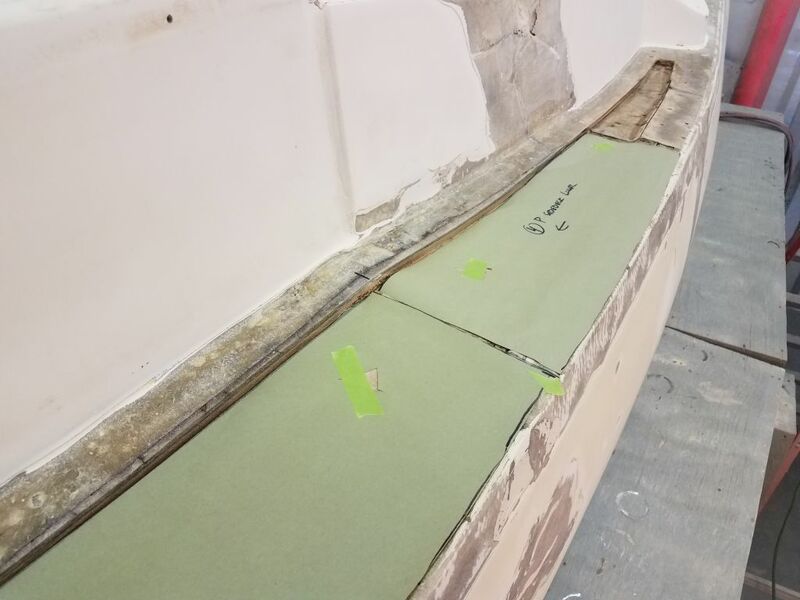 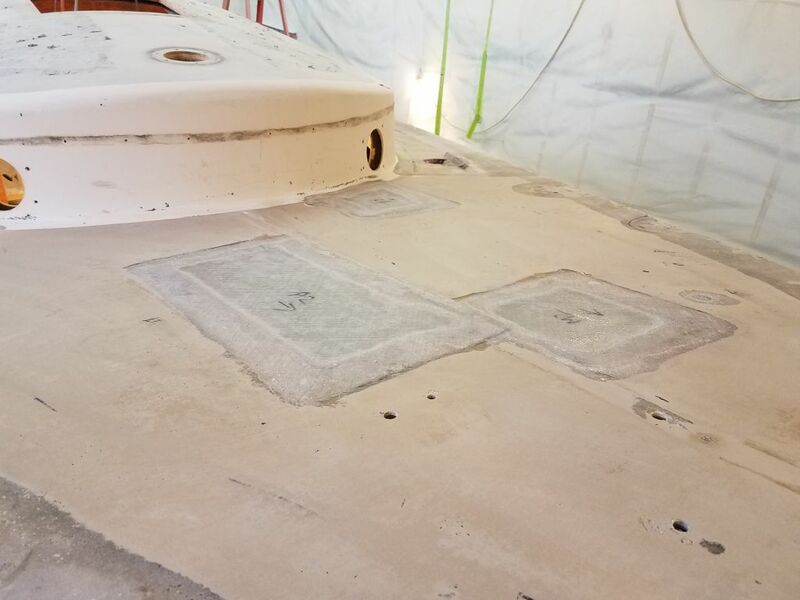 My plan for rebuilding the port sidedeck included starting with a new layer of fiberglass over the existing inner deck skin. 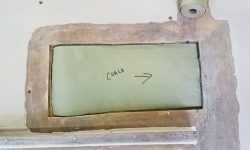 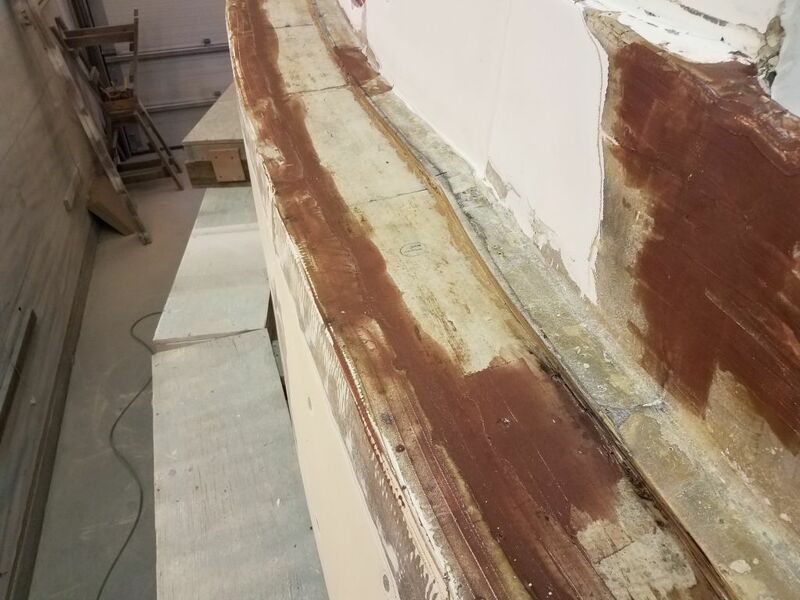 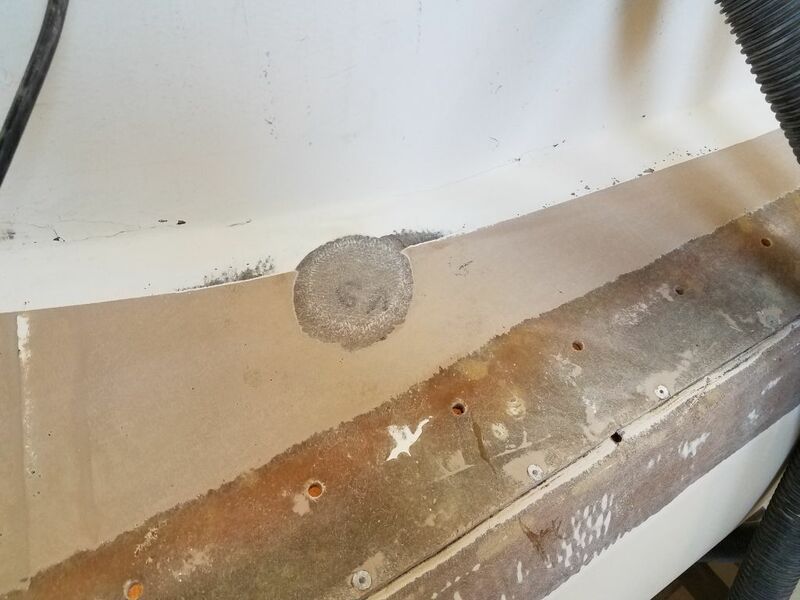 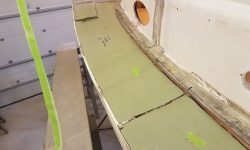 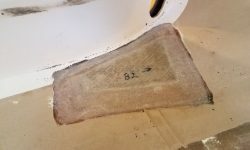 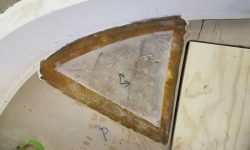 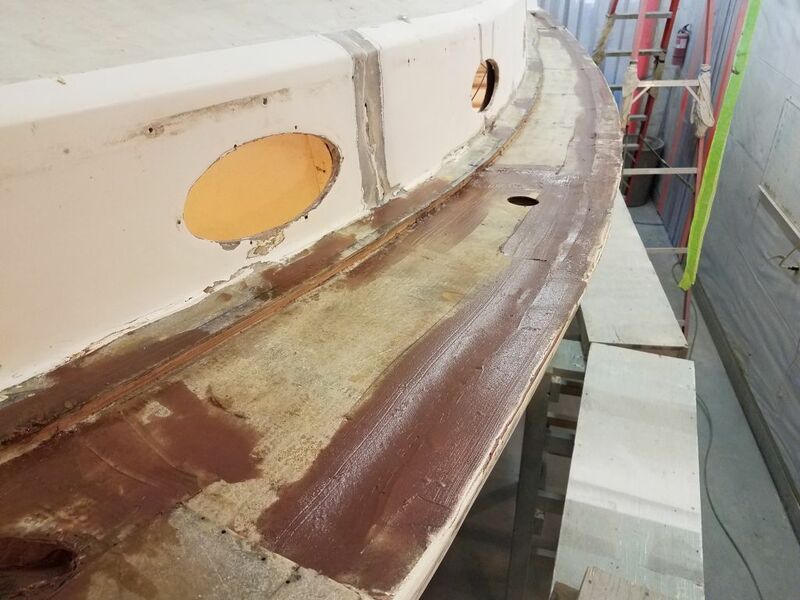 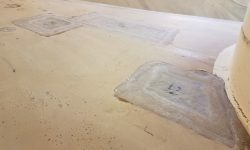 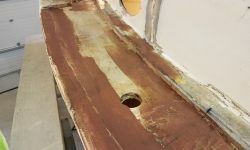 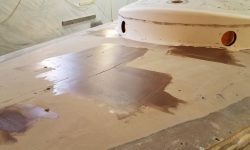 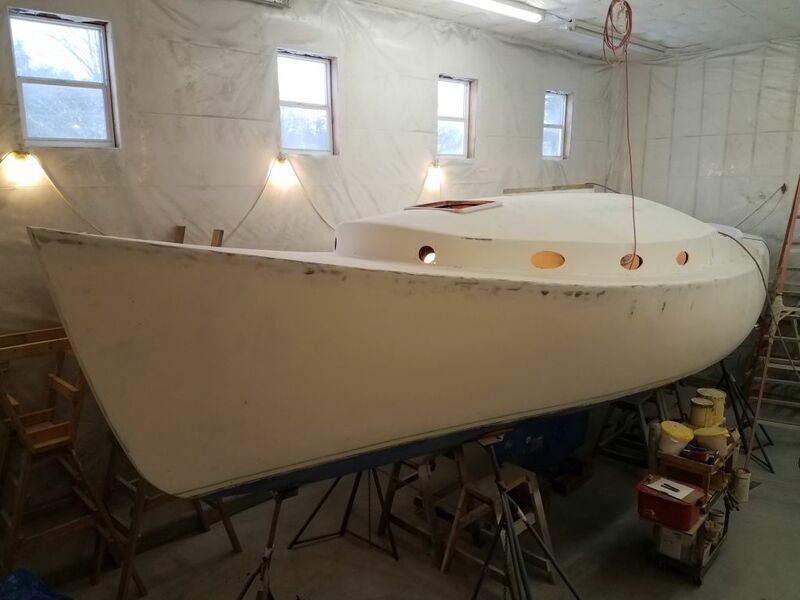 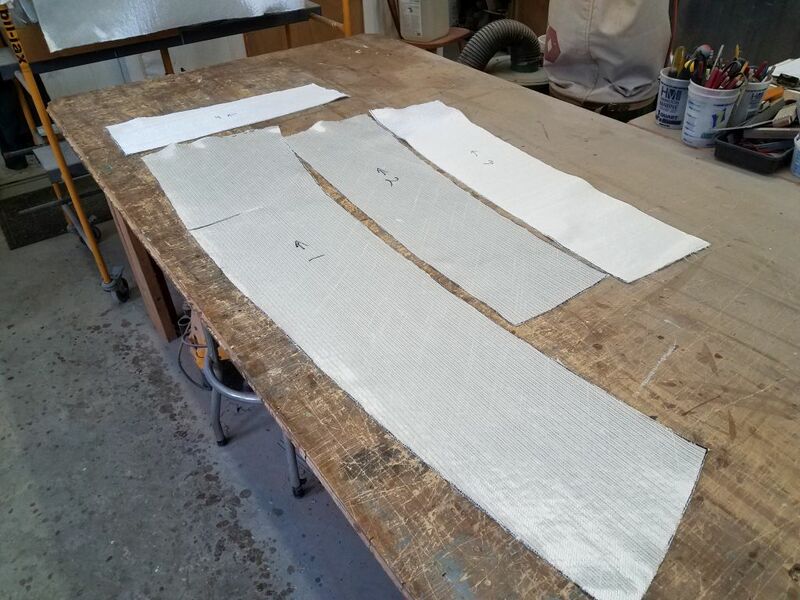 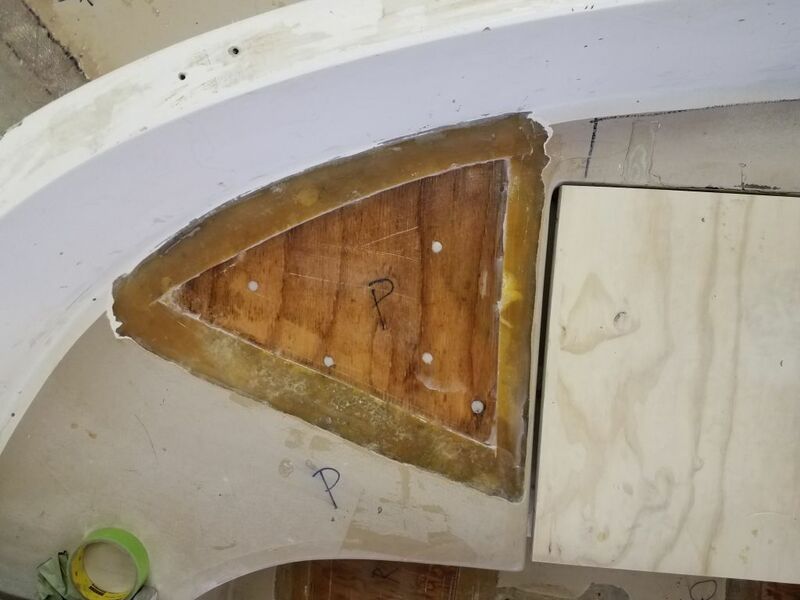 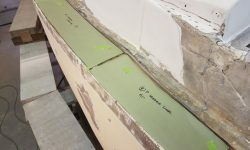 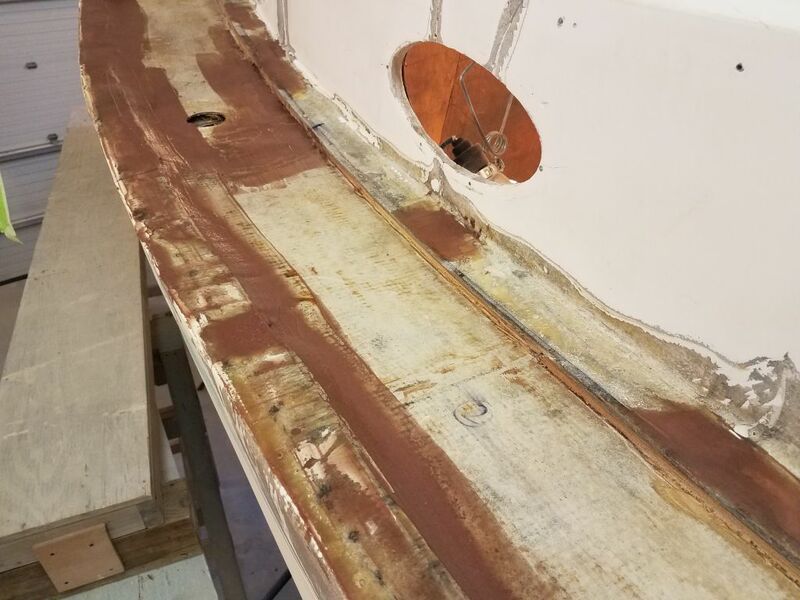 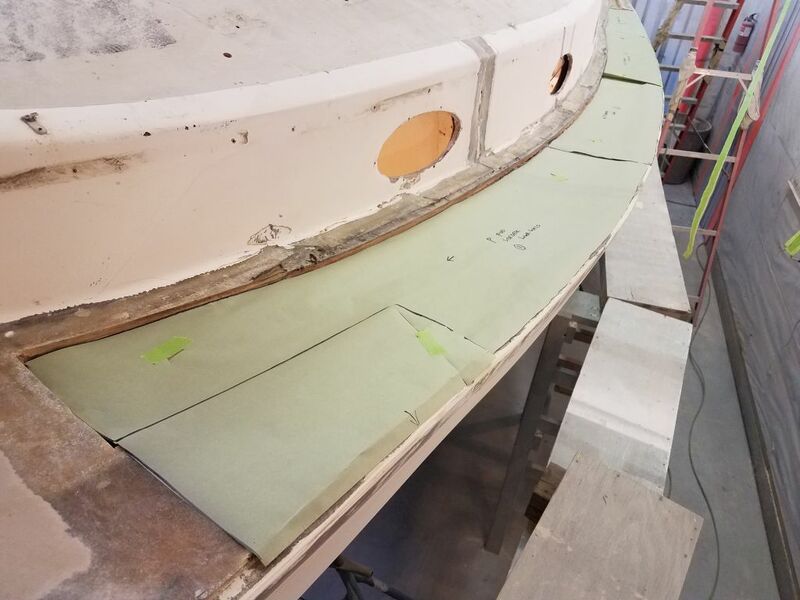 This would help tie in the existing skin with the surrounding structures again, including the hull/deck flange, as well as provide a sound base for the new core and top laminate. 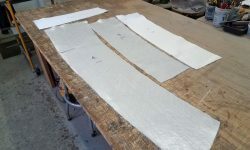 To this end, I made patterns of the area that I used to cut new 1708 fabric in several pieces to fit. 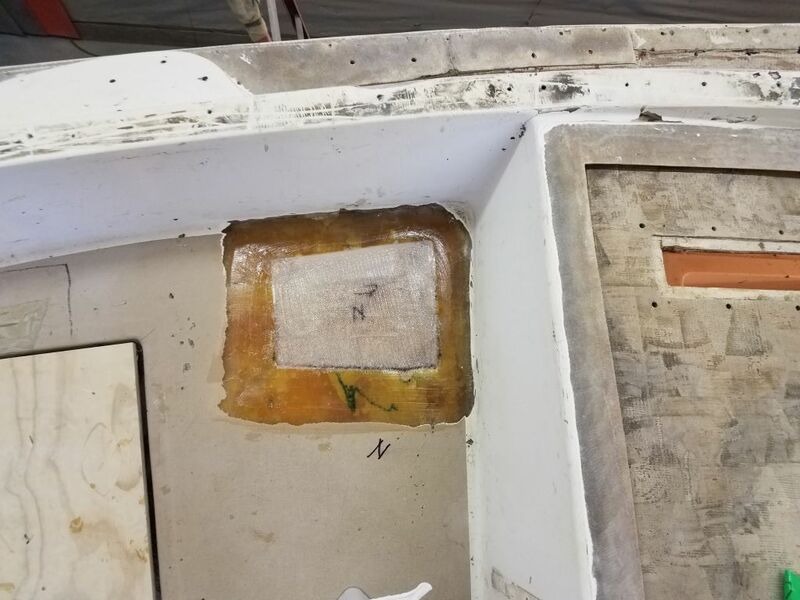 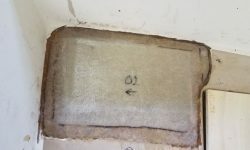 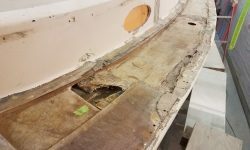 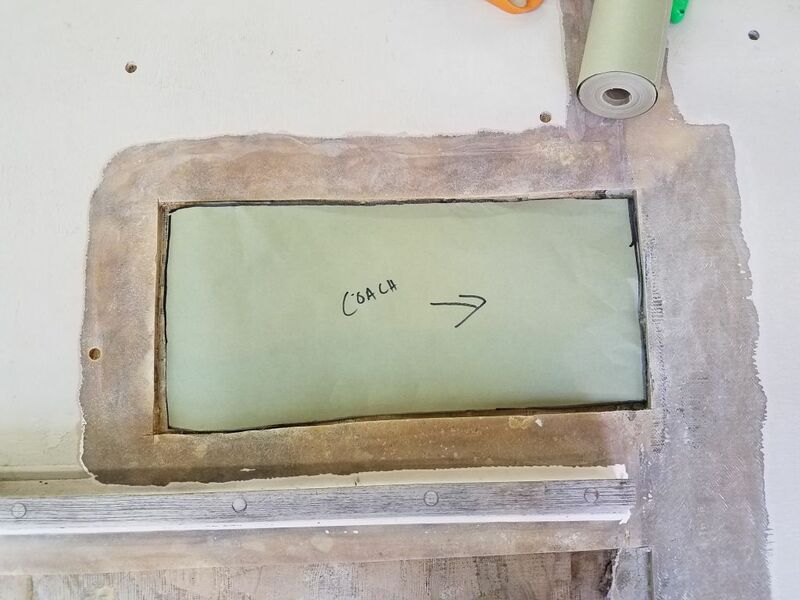 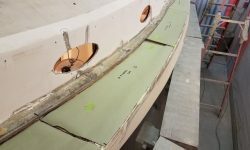 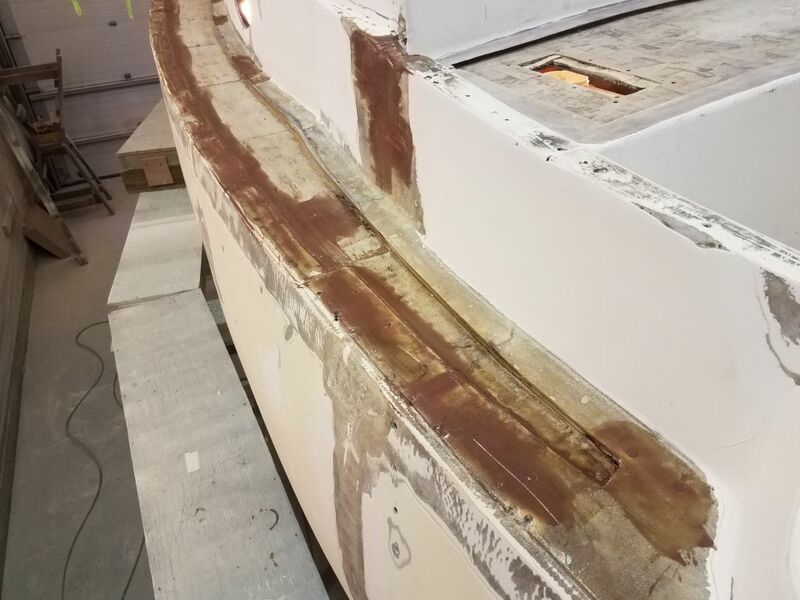 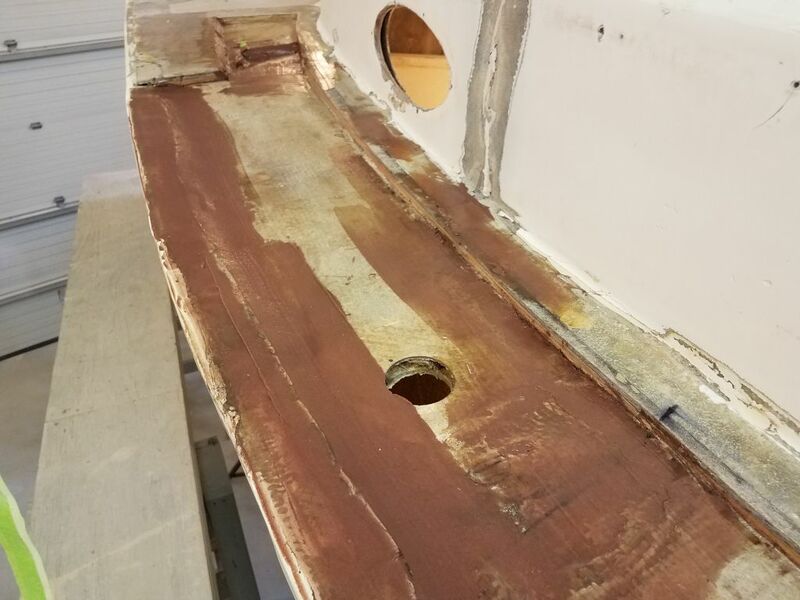 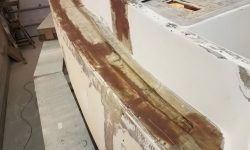 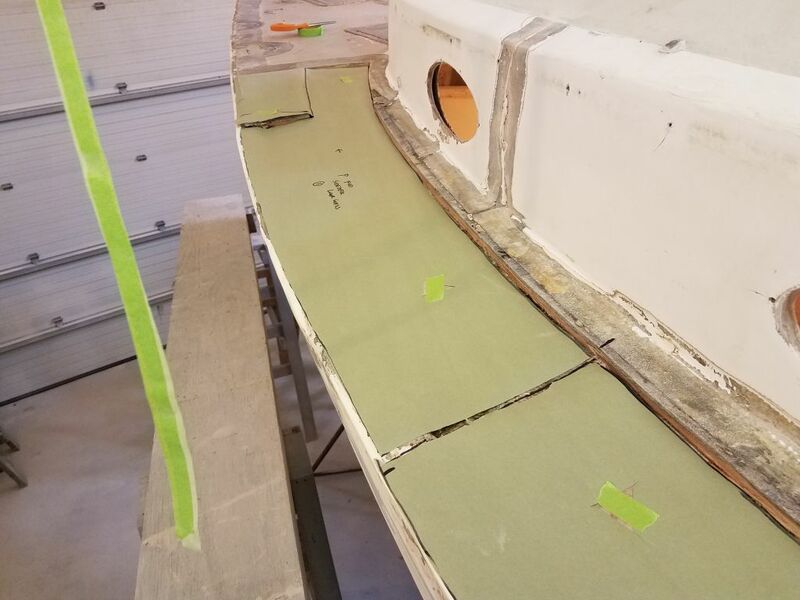 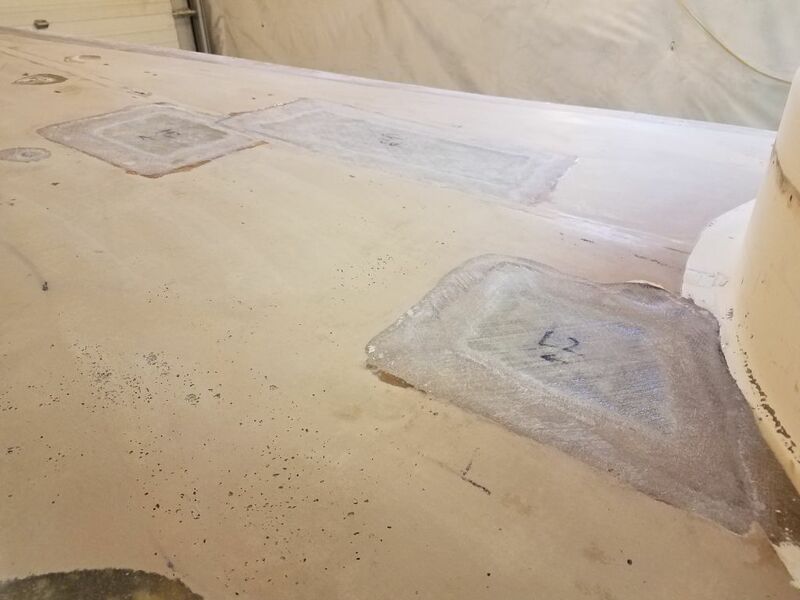 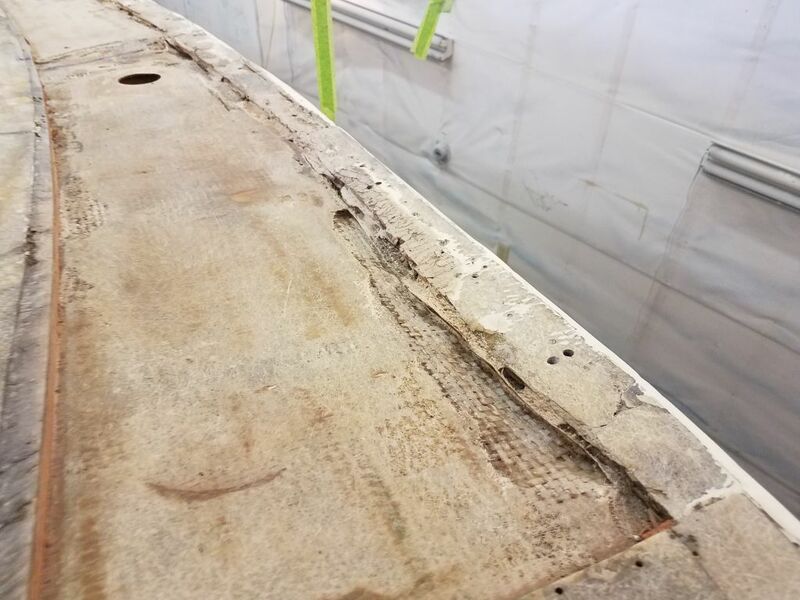 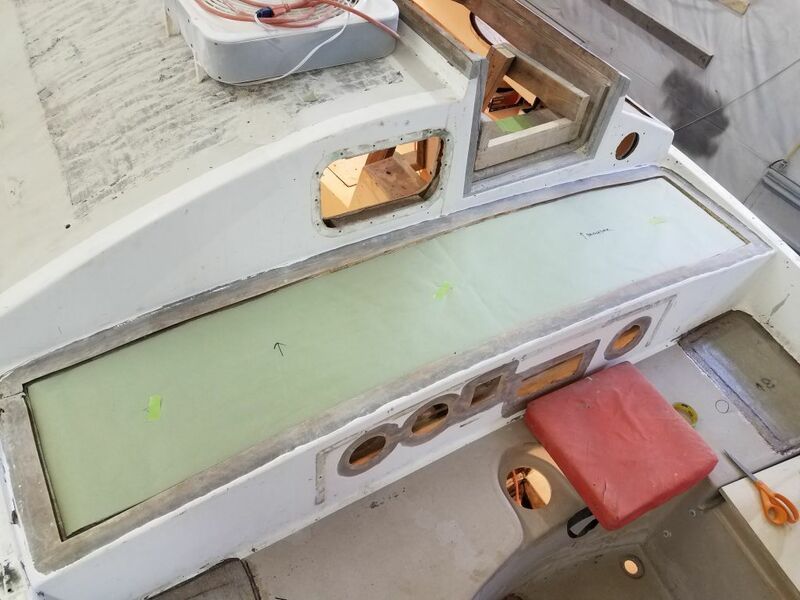 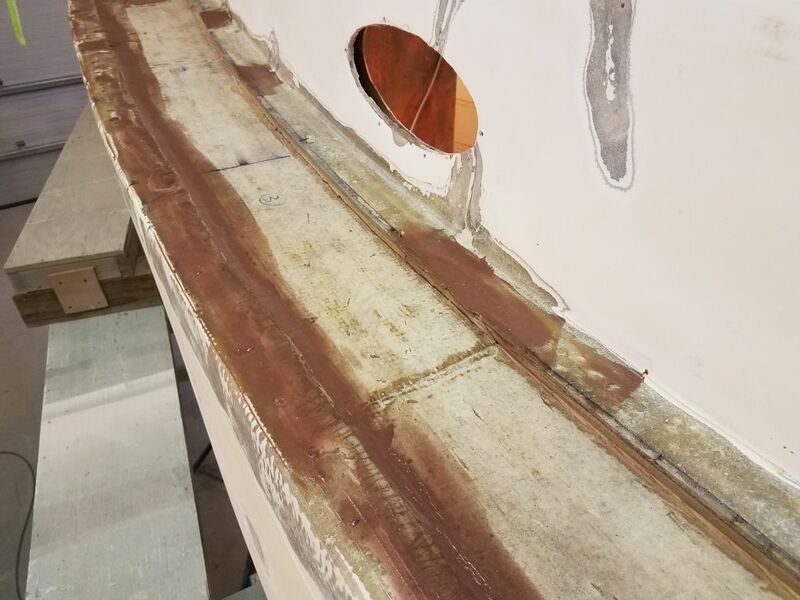 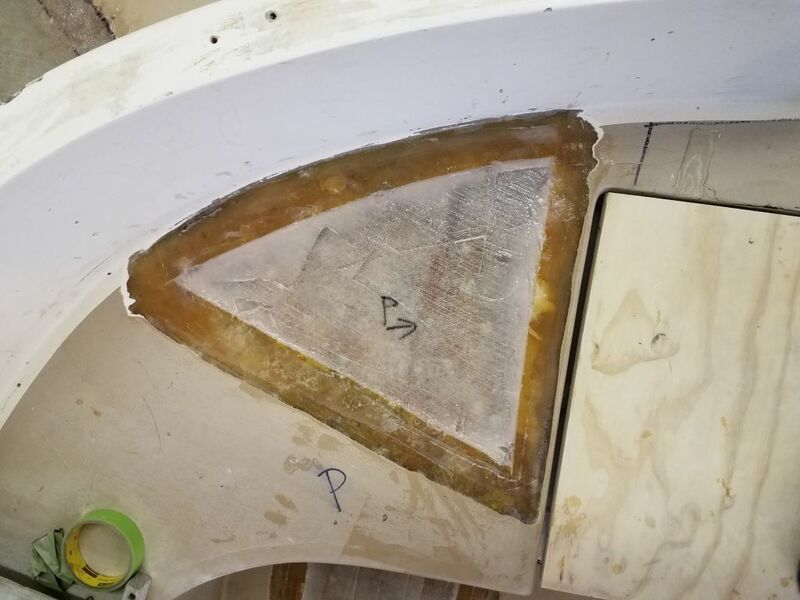 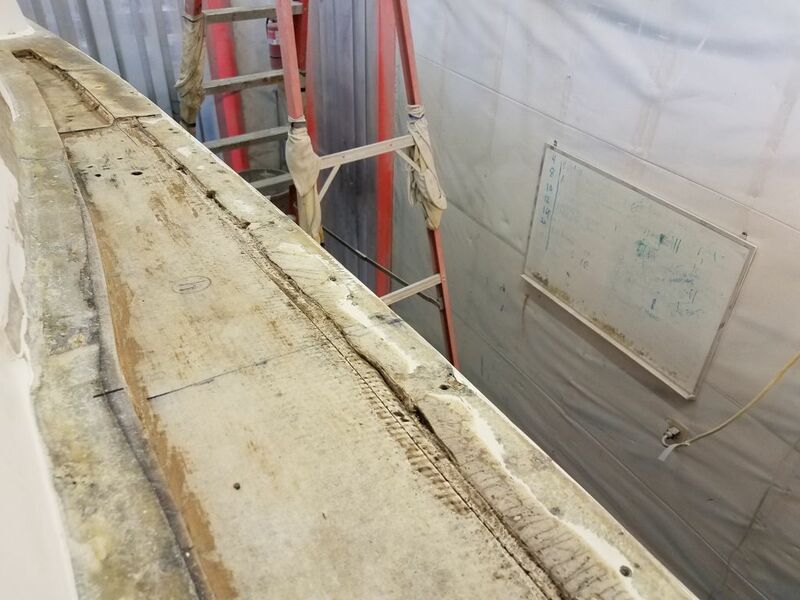 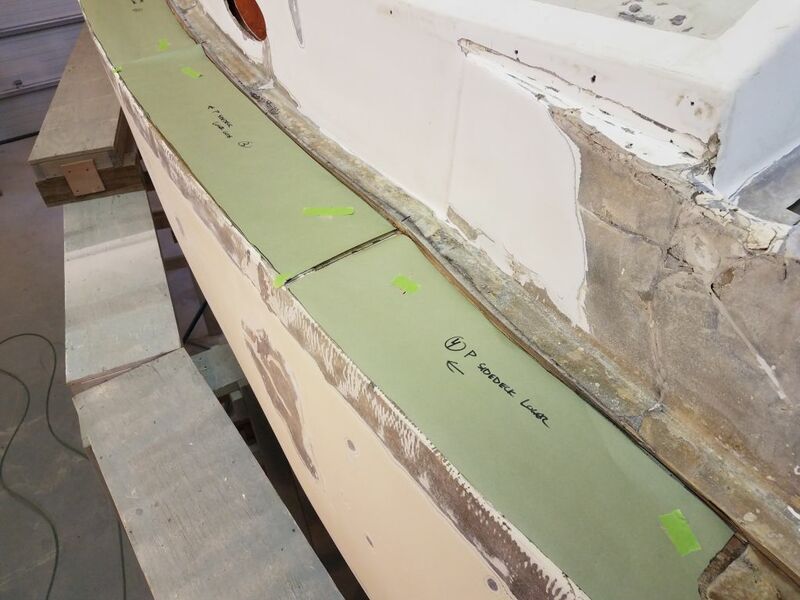 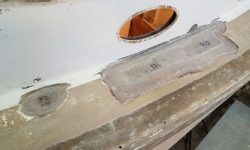 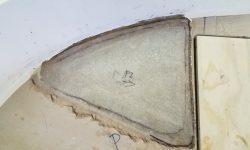 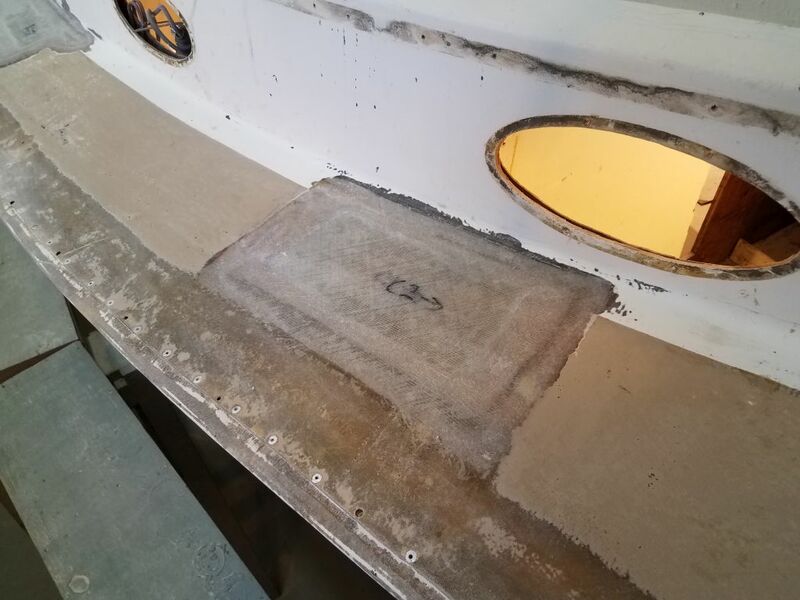 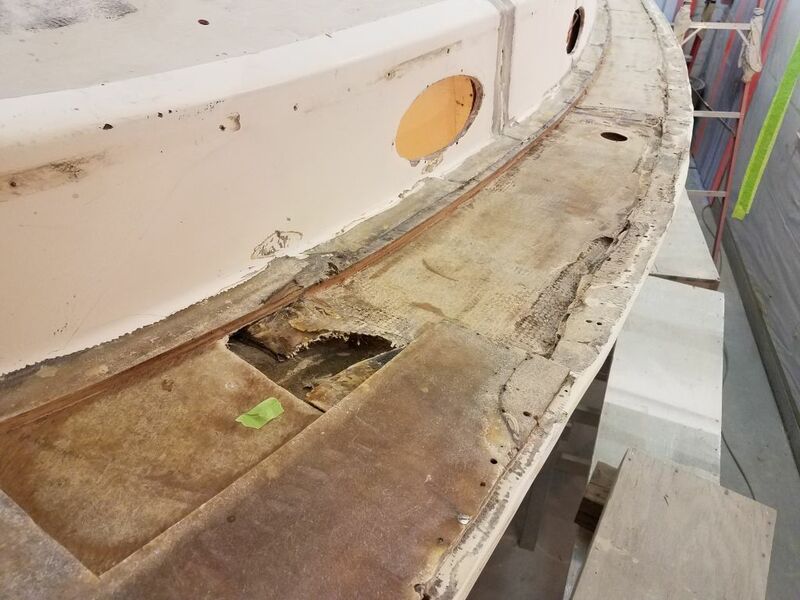 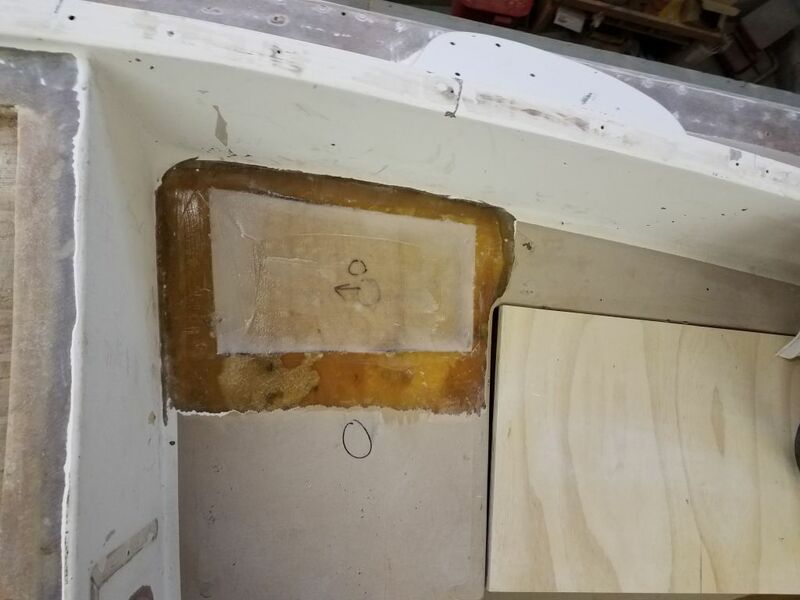 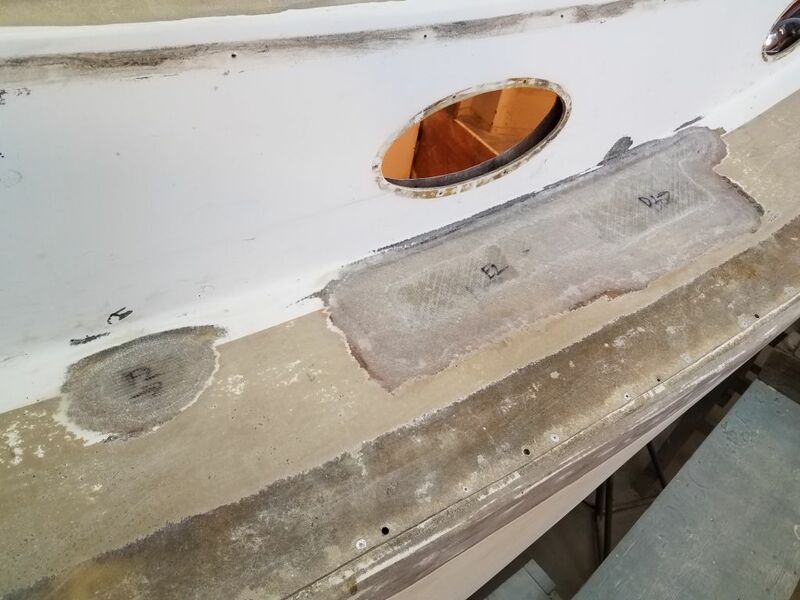 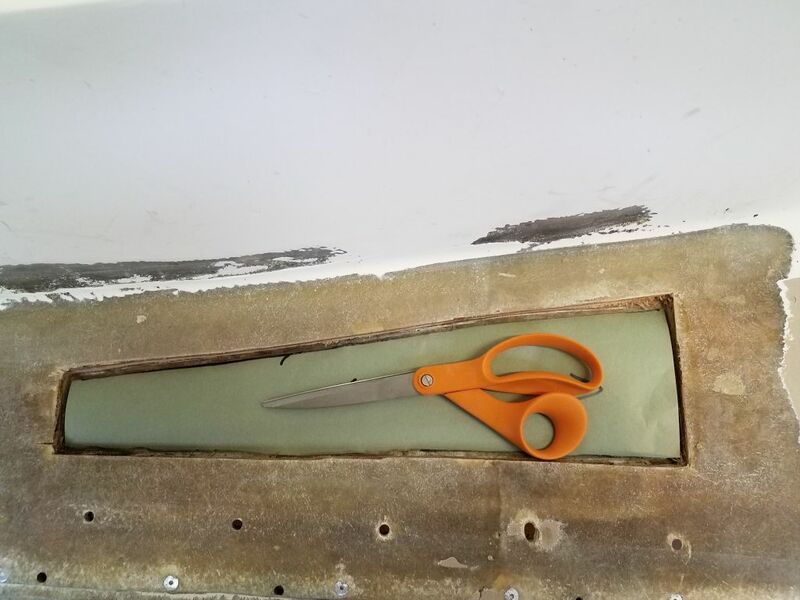 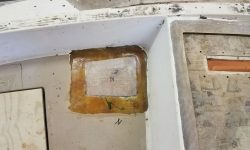 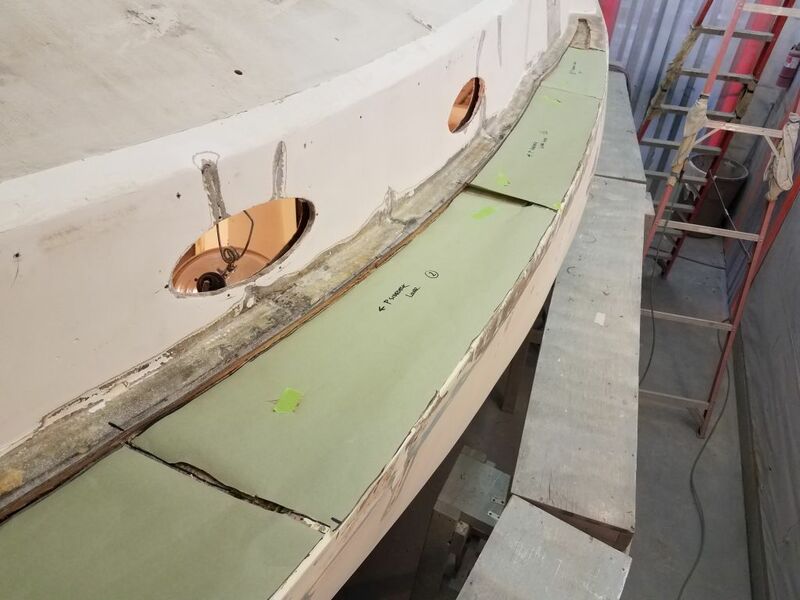 The new glass would extend from the inner edge of the old core, near the flange at the cabin trunk, all the way to the edge of the hull to tie the whole area together. 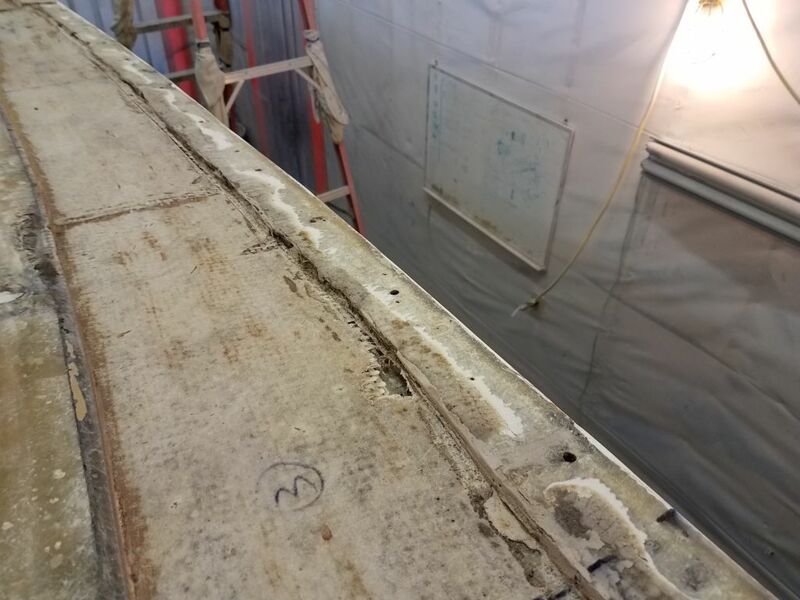 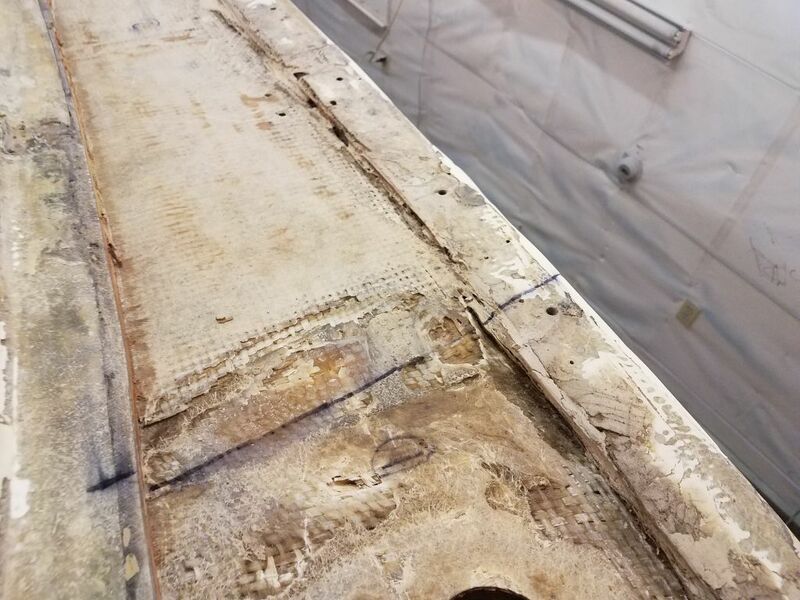 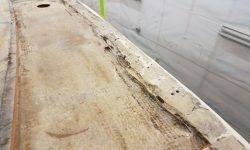 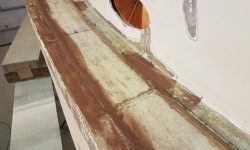 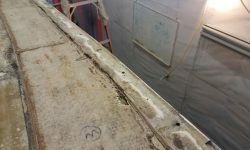 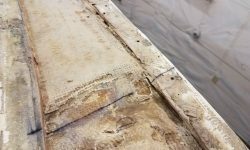 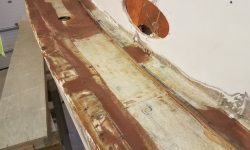 The existing inner deck skin and the transition at edge of the hull featured various voids, depressions, and rough edges, a combination of ills from previous repair efforts (including an inner skin that was tabbed to the inside of the hull below the original hull flange), damage subsequent to those repairs, and removal efforts. 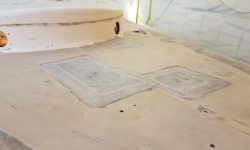 To begin to prepare this deck for new work, fill low spots, and smooth out the transitions, I applied a coat of thickened epoxy to these areas. 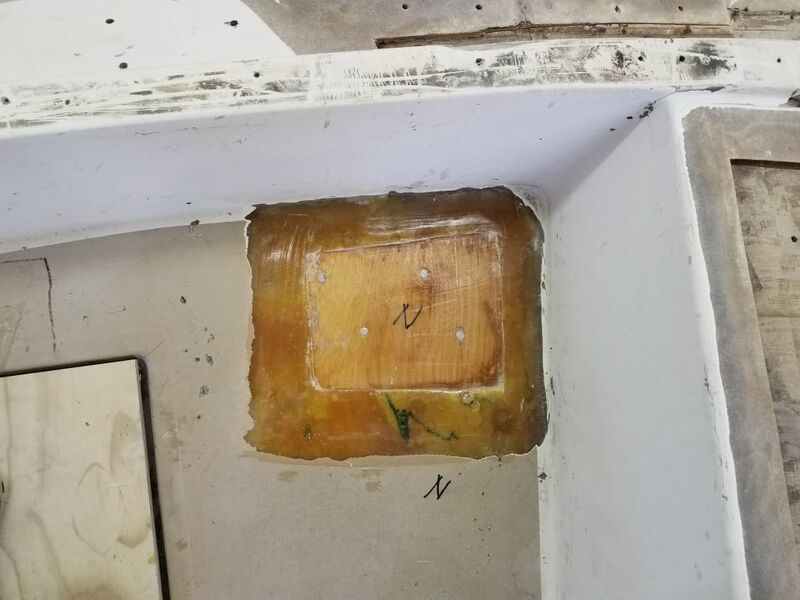 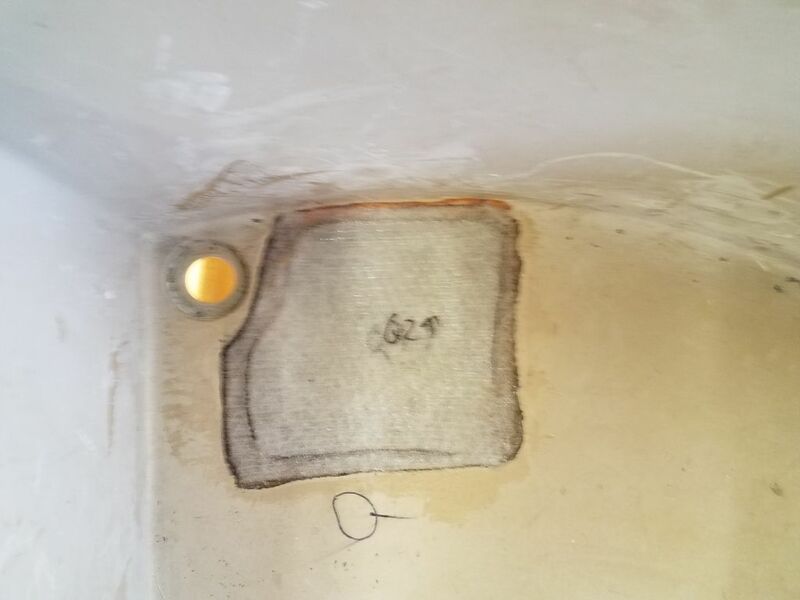 With a bit of unused fairing compound remaining at the end, I used it to start to smooth out the old damage in the port cockpit coaming so I could fully rebuild that area later. 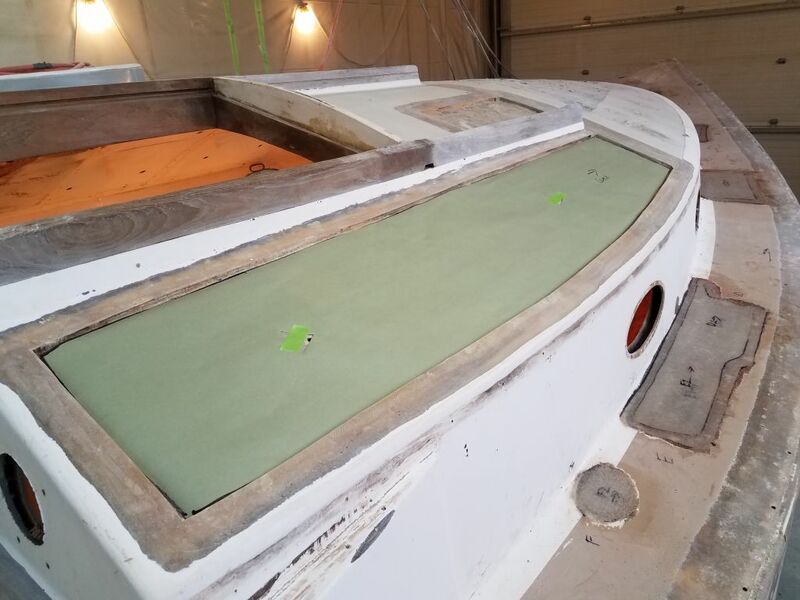 On the main decks, I went around and sanded the new fiberglass patches I’d installed last time, bringing the edges smooth and flush with the existing decks as necessary. 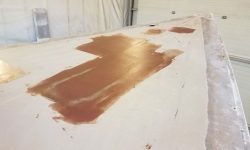 At the same time, I did an initial sanding of the nearby deck surfaces, which featured the original gelcoat and mild nonskid pattern. 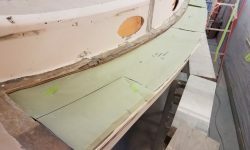 With substantial new work and plenty of fairing and sanding still to come, I didn’t make an effort to fully prepare the old decks at this time, as future work–including the fiberglassing for the hull/deck joint and the fairing to go along with it–and later sanding efforts would see me going over these areas again and again. 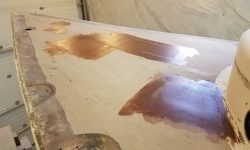 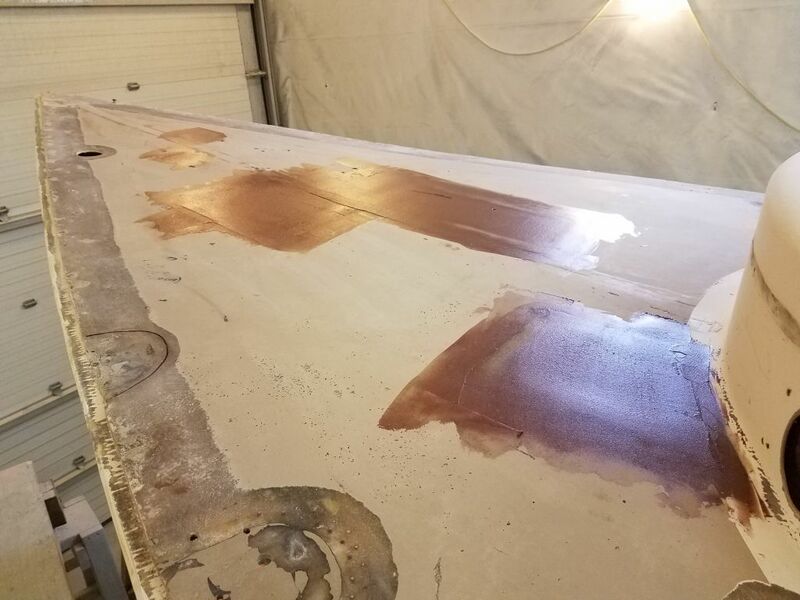 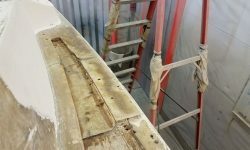 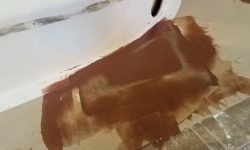 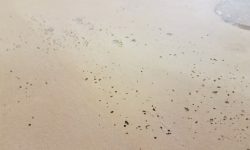 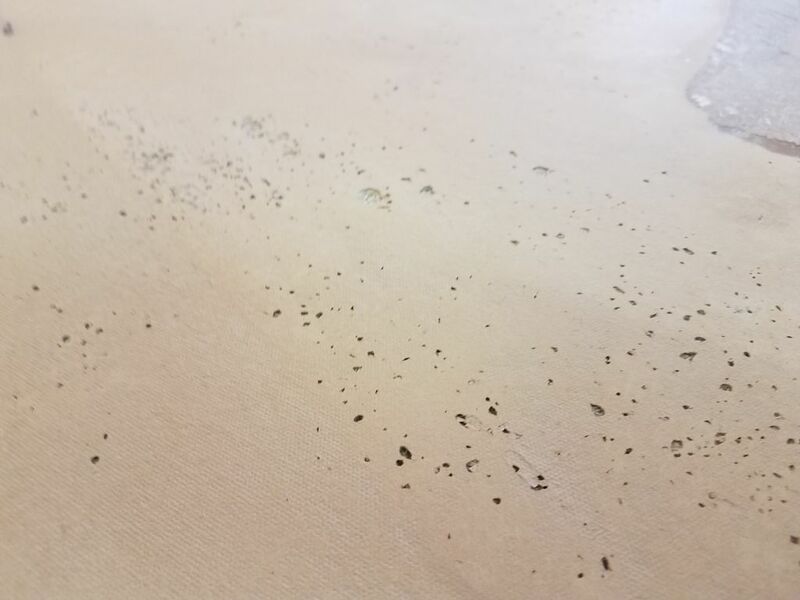 Some areas of the original deck had numerous gelcoat voids that I’d have to take care of as well, but with the existing sanding I could now start to address these issues as I worked in nearby areas in the coming days and as surface preparations continued. 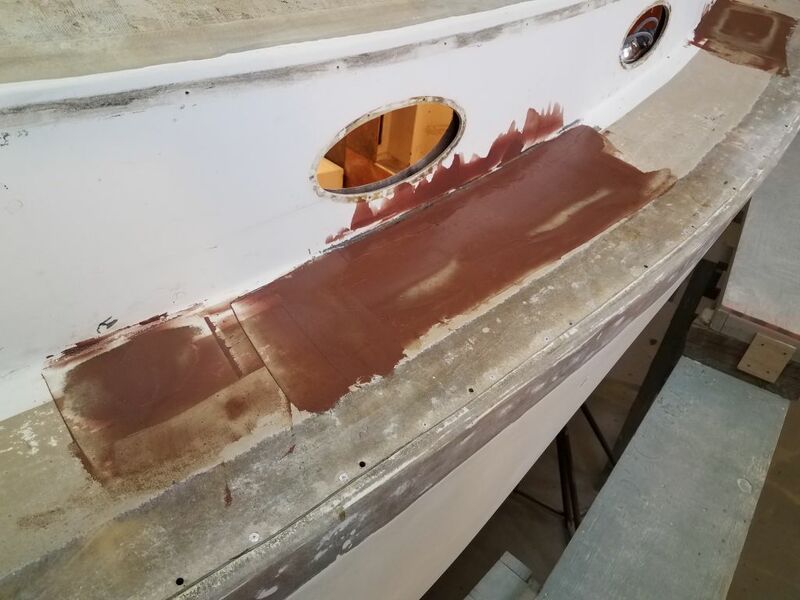 Afterwards, I cleaned up and applied a first coat of epoxy fairing compound to the main deck patches.